Pellon tyres MOT; presents another exciting car (Lanchester) at Pellon Autocentre for its annual MOT test. (it passed with flying colours). 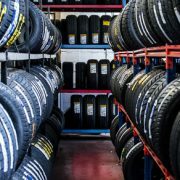 Pellon tyres MOT; This blog is a short article about the diversity of cars that come to us for MOT testing at Pellon Autocentre, and Eric Roberts would like to thank the owner for trusting such an expensive car into their care. The car, designed by Mr George Lanchester, who followed an upmarket version of the” BSA ten” from around 1933. Furthermore,they also developed a car known as the Roadrider or the Fourteen before the second world war broke out. Consequently, Lanchester was bought out by BSA, who also owned Daimler. Furthermore, Lanchesters were made to take second place to the new Daimler models in production. Sadly the last model of the Lanchester known as the sprite was phased out in 1956. Ultimately, this sale was considered a bargain by the financial institutions and a fraction of the real value of the company. Lanchester was now the sister company of Daimler and production, transferred to their factory at Radford. Lanchester cars came outfitted with Dunlop tyres known as the” Dunlop Gold Seal tyres”. Especially relevant, these were also followed by Avon tyres the “Avon Turbospeed tyres” and also Michelin tyres appeared on the market. These days many tyres are imported. A make called “Goodrich Silverstone tyres” are now available from specialist tyre dealers. Finally, I hope that this blog is interesting, we at Pellon tyres Department are very proud to be associated with cars of our past heritage and history. https://www.pellonautocentre.com/wp-content/uploads/2015/06/Logo_PellonCleanTrans.png 0 0 Eric https://www.pellonautocentre.com/wp-content/uploads/2015/06/Logo_PellonCleanTrans.png Eric2018-09-01 05:19:422019-03-24 06:11:52Pellon tyres MOT-Lanchester Vintage Car Passes its MOT, not surprisingly in mint condition. Yokohama tyres and Kumho tyres to join forces in Research a development and perhaps More?